Update : Freespace 2 is now unlocked and available on Steam, and is marked down 50 percent to $5 until June 13. Volition is most closely associated with the Saints Row franchise these days, but to a certain class of joystick-owning oldsters, the name brings something else to mind: Freespace . It was the first project for the developer, and one of the last bastions of the space combat simulation genre. Today. 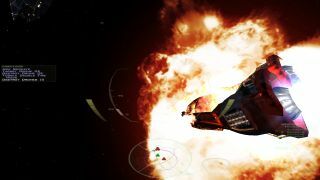 the entire series, including Freespace 2 , is available on Steam. Why now? I'd guess that the rather surprising interest in projects like Star Citizen and Elite: Dangerous have something to do with it. After all, aside from a few niche exceptions, the space combat sim has been dead for years—since Freespace 2 came out in 1999, really—and I don't think anyone expected Chris Roberts' "PC or bust" appeal to old-school joystick jockeys to go over quite as well as it did. But there's obviously demand for this sort of thing, the kind of demand people are willing to open their wallets to indulge, and if there's any one "must play" space sim on the market, it's Freespace 2. This isn't the first "modern" release of Freespace 2, for the record; it's been available on GOG for awhile now, alongside its predecessor , which is a mighty good game in its own right. But if you have a "Steam or nothing" tendency, this is a good way to get into a great, great game. Freespace 2 on Steam isn't actually available at this second, but is expected to unlock on the service shortly.